I hadn't been to Florida since I was 7 years old and barely remembered it so I was happy to continue running away from winter there. I left Savannah armed with trail mix, the Hamilton soundtrack, and a full tank of gas for my 500 mile trip. This was the scariest part of my trip so far. Not only was I almost run into the highway divider by an 18 wheeler, but following that I had to drive through 2 hours of on and off thunder storms. I finally arrived in Davie to meet my friend and former coworker Jon at his dad's restaurant, Pizza Loft. He was still in class when I arrived, but I was super hungry after driving all day, so I ate a solo luxurious pizza dinner by myself with the best garlic knots I've ever had in my life. 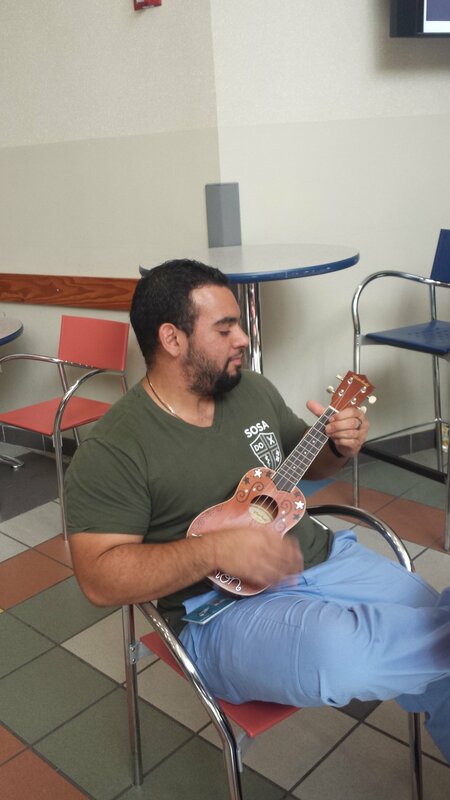 The next day, I went to med school classes with Jon at Nova Southeastern University and taught some of his classmates after sitting in on some classes (in borrowed scrubs). 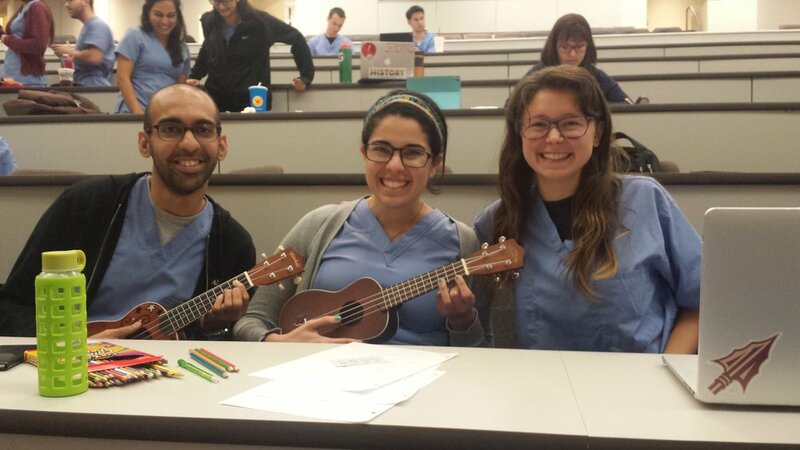 Med school is definitely not for me, but I did enjoy giving students a study break! Med student for a day! Jon let me borrow his scrubs. My next stop was to stay with Taylor (another friend and former coworker) in Surfside Miami. I was welcomed to her house with a Friday night dinner and a fresh coconut that her dad chopped open with a machete in the backyard. It was delicious. I spent as much time at the beach with Taylor as possible, when it wasn't raining. I stayed in Miami for a few days. 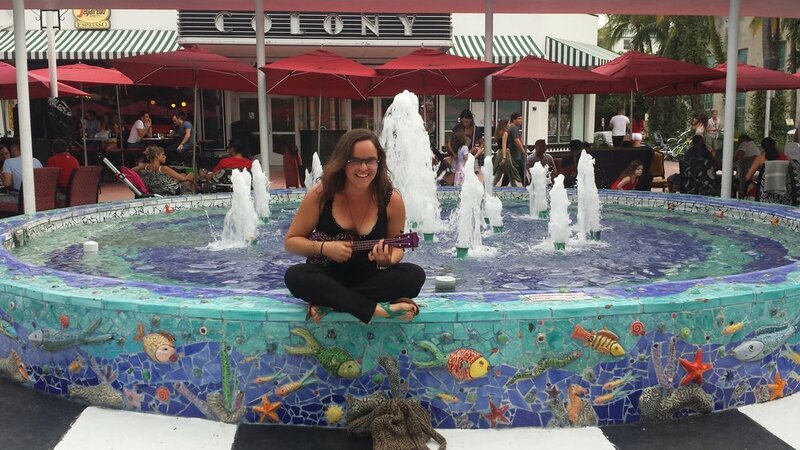 My waterproof uke really came in handy, and I was able to teach people I met at the beach. I don't think I'll ever get all of the sand out of it completely, but it was very worth it. On my way up to Boca Raton for the night, I made a few stops. I stopped by Pizza Loft again and played for the cooks who make the most amazing garlic knots ever. I seriously miss those buttery, garlicky, knots of heaven. Next I stopped by the Penny Lane Music Emporium in Fort Lauderdale to meet the owner, Fernando. I started following him on Instagram because he always posts pictures of people "adopt" instruments at his shop and I think it's awesome! It was so great to meet another person trying to put music in people's hands and fingers. I hope we meet again one day. If you ever find yourself in Fort Lauderdale, I highly recommend checking out his shop! Next I stopped to meet some good friends of my dad from his high school days. Bob, Karen, and their kids were so welcoming and it was great to hear some embarrassing new stories about my father. 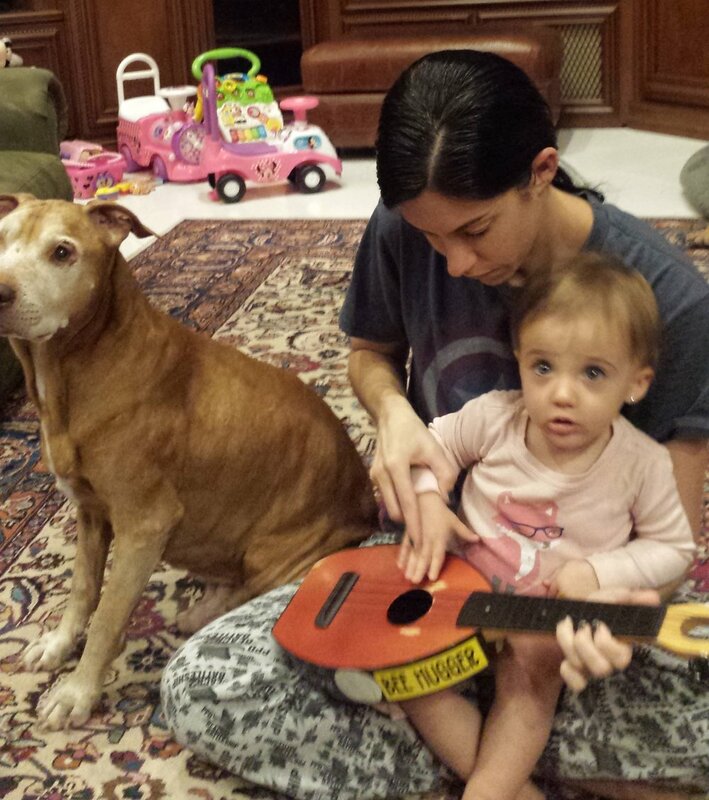 I stayed the night with some more family friends I'd never met before, and let their adorable granddaughter play around with a uke. I taught 22 people in South Florida! My next destination was Tallahassee to stay with Jon's friend Kevin. Off to the panhandle!! I stayed with Kevin neat FSU and took my wagon of ukes to campus in the morning. I taught about 15 college students which was really fun! But then I lost my big sign which was not as fun. Oh well, I hope whoever finds it enjoys it. Florida was so sunny and I got to reconnect with people I love, plus meet new wonderful ones!